MF Films - 88 min. 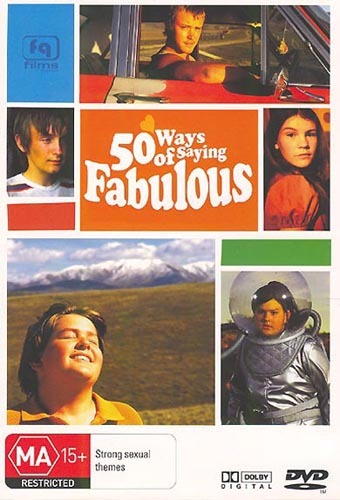 Cast: Andrew Paterson, Harriet Beattie, Jay Collins, Michael Dorman, Rima Te Wiata, Georgia McNeil. Production Design: Ken Turner; Producer: Michele Fantl; Director: Stewart Main. Shot in and around the central Otago communities of Omakau, Ophir and Alexandra, this coming-of-age film centers on overweight 12-year old Billy who is not interested in being a farmer and doesn't care for Rugby. His escape is the fantasy world of the TV show, Adventures in Space where he dreams about playing the heroine Lana. Of course all this doesn't make him the most popular with his school mates, but his tomboy cousin Lou buffers those problems. Into his life comes two new boys, Roy and Jamie that are destined to provide the catalyses in changing Billy's life. Recommended. It is available in Australia and New Zealand as an R4 PAL DVD for about $20au or $25nz. An R1 ntsc disc is available from various U.S. sources for $25-30us. The disc is DVD9 1.78 widescreen 16x9, 5.1 dolby digital. English only - no subtitles. The Extras are plentiful: 50 ways of Filming (43 min. ); 3 deleted scenes (4+ min. ); Theatrical trailer (2 min. ); Photo stills gallery; B-roll clips (10+ min. ); 3 Interviews (34+ min.). Also within the "Interviews" section are listed the two commentary tracks, one by the director and editor and the other by three of the actors. These commentary tracks should also be accessable from your remote "Audio" function key.